“Wow, nice to see you all,” she said peering out from the bright lights of her stage, smiling at the crowd of over 29, 000 conference attendees. 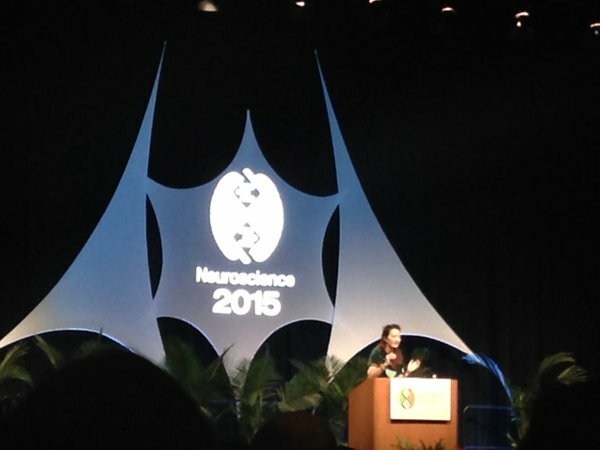 These were the first words Dr. May-Britt Moser spoke when she took the stage for SFN’s 2015 Presidential lecture last Tuesday. It was really nice to see her too, of course, and though we were weary from 5 days of conferencing, the room was full of anticipation. A word on neuronal naming conventions: Stimulus-responsive cells are named based on the specific stimulus parameter they are most sensitive to. In other words, they fire (or in the words of May-Britt Moser: pop-pop-pop-pop-pop!) when they are presented with a stimulus they like. For example a flapperdoodle cell is a cell that goes pop-pop-pop when it sees its preferred flapperdoodle, or to use a “real” example, orientation-specific cells are those that fire maximally in response to a visual stimulus of a given orientation. The term “cognitive map” was first coined by Edward Tolman in 1948 in his classic psychology paper: “Cognitive maps in rats and men”. In it, he describes a series of experiments in rats demonstrating the “purposive” (intentional) spatial navigation that they take through a maze. The idea that he and those in his camp (termed, unflatteringly “Tolmaniacs”) was that rats (and men…and presumably women too) were using a mental map of space to navigate accordingly. Thirty years, later the discovery of place cells gave Tolman’s cognitive map theory a concrete physiological basis. Tolgeniuses? Where am I and which way am I headed? They stabilize within minutes to hours of entering a new environment (pups and adults both show an early emergence of place cells). They provide a robust code; it takes a recording of about 100 cells for 10 minutes to determine where the animal actually was, in physical space, within a one-cm accuracy. There’s obviously much more to be said about place cells, and you can learn more about them here and here and here (that last link is a TedTalk by Neil Burgess). In a bit I’ll discuss what the Mosers did to figure out where these place cells come from, but first, let’s talk about the brain’s “compass”. Head Direction Cells: Originally discovered in dorsal presubiculum, by Taube, Muller, and Ranck in the 1990s. These cells, often likened to a compass, are cells with different cardinal direction preferences. In lieu of anchoring to the Earth’s magnetic field, the way an traditional compass does, these cells are dependent on landmark and self-motion cues. Importantly, they are quite specifically head-direction cells and do not fire upon simply by a change in direction of eye gaze [More on: Scholarpedia]. 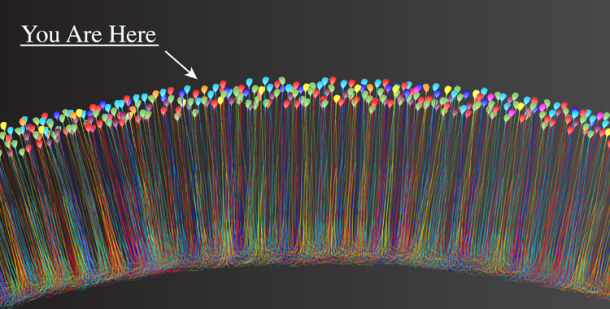 Head direction cells are orientation-specific and location-invariant. Place cells are location-specific and orientation invariant. This is all very cool, but …. where do these signals come from? Those of you who have kept up with the most recent Nobel Prize win (2014) in Physiology and Medicine know that it was awarded to O’Keefe (for the discovery of place cells) and to May Britt and Edvard Moser (for their discovery of grid cells) — and if you’ve ever heard the Mosers talk about their scientific journey, you know that the discovery of grid cells is intimately connected to an attempt to understand place cells. Specifically, the question that led them to grid cells was: How are place cells generated in the first place? Since the place cells were found in the (dorsal) hippocampus, the first area of suspect was – yep, you guessed it: the hippocampus. One of the most common ways scientists test to see whether a certain variable (brain area, gene, molecule, etc) is necessary for the observed phenomenon at hand, is to play a little game called LOSS OF FUNCTION. In this version of the game: disrupt hippocampus to observe its effect on place cells. What happened when they performed this lesion? A big fat: nothing. The place cells were undisturbed. So, the fearless explorers of the brain that they were, the Mosers decided to go “upstream” to structures that provide inputs into the hippocampus: entorhinal cortex (EC). More specifically, they looked at Medial EC (MEC) to dorsal hippocampal (dHPC) connections. Together with Menno Witter (who now works down the hall at the Kavli Institute in Trondheim), they targeted this region for the loss of function game, instead. What happened? Partial disruption of place cells…so not a clean removal…but something even more interesting: they discovered another kind of spatially-tuned cell: GRID CELLS. The discovery of grid cells (GCs) was strange and fascinating and it opened the door to a whole new set of questions about the computation underlying spatial representation. The pattern they observed was reminiscent of place cells; GCs did seem to fire when the rat was in specific regions of space but it wasn’t uniquely the same position, which generated the maximal pop-pop-pop response. Instead, GCs show spatially periodic firing fields. In other words: grid cells know not only where to fire but where not to fire. These cells represent a perfect tessellation – with triangles that connect grid vertices. 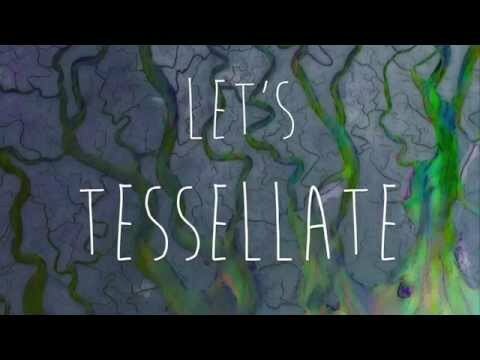 Do they all tesselate in the same way? Actually, no — as you move from dorsal to ventral hippocampus, the grid cells grow larger in scale and decrease in resolution. They can map spaces at least as large as 3 meters. In a fun experiment by Brun et al, in the Moser lab, rats ran down an 18-meter long linear track, toward a chocolate reward at the other end. All the while, the Mosers recorded grid cells with different tessellating patterns and characterized them along three main parameters. Scale is a particularly interesting parameter. In analyzing the data, the Mosers found that not all possible spacings were accounted for. Instead, there were specific patterns of firing that characteristically appeared (40cm, 50-60cm, 70cm and 95cm) at discrete steps. The different scale values were then clustered into what the Mosers deemed as grid cell “modules”, abbreviated as M1, M2, M3, M4 for the four different scales. Starting to feel a bit strange? It gets weirder: if you take the ratios between the modules (for example: M2/M1, M3/M2, etc), the resulting value is approximately ~1.4 (which math aficionados will readily recognize as the square root of 2). It’s not clear why this might be the case, but it’s possible that this is the optimal way to represent the environment at a high resolution with a minimum number of cells. You can bet your better’s hat that theoretical neuroscientists are hard at work attempting to crack this problem. Interestingly, modules respond independently to geometric transformations (if M2 grids rescale to a change in the environment, M1 grids can still remain stable). Within given modules, the grid map is rigid and universal. 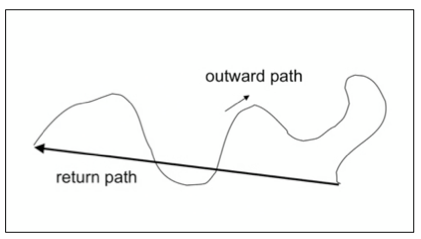 Scale, orientation and phase relationships are preserved across different environments. Lastly, although GCs are anchored to the environment, they remain stable even in the absence of light. It is this stability that has implicated grid cells in a process known as path integration. Border Cells: Also known as “Boundary Vector Cells” or “BVCs”. These cells are, you guessed it, active at the edges of environments. Or in the clever words of Asher Mullard, these are neurons “on border patrol” . They are sensitive to borders, period. They are not localized to specific portion of an edge or border. If you stretch the wall, the cell will likewise fire in response along that extended edge. It has been suggested that border cells are a way for grid cells to stabilize or “anchor” to their environment. However, more work needs to be done to clarify what computation border cells are performing and how they are actually contributing to spatial navigation. Speed Cells: Cells which are linearly sensitive to speed. These cells are also consistent with the role of path integration in translating activity across grid cells in a moving animal. According to May-Britt Moser, only 3-6 speed cells are sufficient for strong prediction of actual speed (mean =0.75). Speed cells were discovered by testing whether or not different speeds could systematically modulate firing rate in a subset of MEC cells. To do this, rats were tasked with traversing a 4m-long track, moving at various experimenter-determined speeds…while in a “floor-less” car. Critical Windows of Development As part of the attempt to figure out how these various spatially-selective cells are generated, it is important to understand the timeline of their development. Interestingly, place cells, head direction cells and border cells appear almost immediately after birth (as soon as they can be measured, they are there). However, grid cells are slower to mature (usually not until post natal day 28). This begs the question: is there a critical window where the environment makes a difference for the development of these cells? To get at this question, May-Britt Moser says: “we have to raise animals in weird environments”. They raised mice in one of three different environments: (1) opaque spheres (thus depriving them of boundaries/borders, geometric and distal spatial cues), (2) in cubes (lack distal cues but have enriched environments) and lastly (3) in ‘normal’ clear cages with distal cues and enriched environments. Interestingly, mice raised in the spherical environment (and transported always in the dark), did not develop normal grid cells; spatial periodicity was substantially reduced in this group compared to those raised in cubes. This implies that grid cells have a critical window of time available to learn about boundaries in the environment and form appropriately. To test the activity dependent formation of these grid cells, the Mosers performed a separate set of experiments, in which they showed that silencing parvalbumin (PV) interneurons disrupts head direction cells and impairs tuning of speed cells. In contrast, border cells and grid cells are unaffected, clearly suggesting distinct networks. Given that these various spatially-selective cells mature at different developmental time points, this differentiable disruption makes a lot of sense. It will be interesting to systematically track the development of all these different types of cells over time. 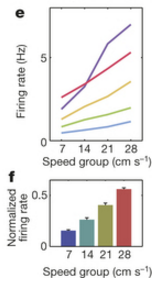 Speed cells fire in response to changing speeds in a linear manner; the speed code is invariant across environments. It’s all very intriguing and inspiring and, at the end of the day: it’s just fun to think about. One of the quotables from May-Britt Moser’s SFN lecture is the one I included next to the summary above: “scientists are like children and they like to play”. It’s so very true! Sadly, in the world of competitive, senseless and increasingly sparse grant funding, we either lose sight of this spirit of play altogether or, in the best case scenario, limit our circle of fun and play to “other scientists” and don’t bother discussing our work with those who don’t speak our jargony language. We consider ourselves interdisciplinary if we talk with someone outside of our own scientific field, but rarely do we share the richness our data otherwise.